Terrance Simien adds Zydeco Flair to Disney's "The Princess and The Frog"
Grammy Award-winning Zydeco musician Terrance Simien is in the news for his spirited contribution to the soundtrack for Disney's film "The Princess and The Frog." Simien plays accordion, rubboard and triangle on "Gonna Take You There," sung by Ray, a Cajun firefly, voiced by New Orleans resident Jim Cummings. Terrance and the Zydeco Experience are the featured performers at The Kentucky Center's Mardi Gras party on February 12. This popular annual event is likely to sell-out. We recommend that you purchase your tickets in advance. The movie, set in New Orleans during the Jazz Age, introduces the first Disney princess since 1998. Princess Tiana also is Disney's first black princess. Louisiana residents will hear references to familiar traditions and familiar foods in the movie, wife Cynthia Simien said. "It celebrates our cultural arts, our musical traditions of jazz, blues, gospel and zydeco." Terrance Simien — a native of the Mallet community near Lawtell and a Grammmy winner for Best Zydeco/Cajun Music Album in 2008 for Live! Worldwide with his band, the Zydeco Experience — was chosen to provide the music for the scene after producers researching zydeco music came across his 1989 debut CD, Zydeco on the Bayou. In the Courier-Journal, Andrew Adler shares his Top 20 list of the most entertaining and memorable classical music and dance performances of the decade, including these artists who were part of our Kentucky Center Presents programming: Alvin Ailey American Dance Theatre, Bill T. Jones/Arnie Zane Dance Company, and Urban Bush Women. Approximately 1000 fans flocked to Louisville's historic Brown Theatre on Broadway in October for an evening of eclectic world music and jazz-influenced jams performed by the amazingly talented trio of Béla Fleck (banjo), Zakir Hussain (tabla), and Edgar Meyer (double-bass). Visit our website to view upcoming Kentucky Center Presents performances: www.kentuckycenter.org/season . Save the date! I know you're busy with holiday preparations...but we want to be sure you make plans to join us at our annual Kentucky Center Presents Mardi Gras party, Friday, February 12, with Terrance Simien and The Zydeco Experience (Bomhard Theater). For ticketing information, please visit www.kentuckycenter.org . As things quiet down (temporarily) for the holidays, we wanted to share some highlights from the first half of our 2009-2010 Kentucky Center Presents season. 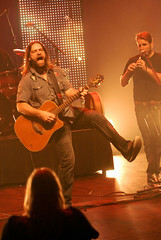 In this photo, it's Alan Doyle, energetic front man for Celtic folk-rock group Great Big Sea, leads the crowd in a sing-along. Photo taken by Stephen Cohen, www.simohen-art.com, all rights reserved. See what's coming up in our season for 2010 at www.kentuckycenter.org/season. Saturday, January 23, 8 p.m.
Paula Poundstone riffs like a great jazz improviser, relying on nothing more than her razor sharp wit and spotaneity. A regular on HBO, Comedy Central and a slew of network and cable talk shows, she is at once cutting and self-deprecating, satirical and heart-warming, insanely intelligent and down-to-earth. Standard ticket prices: $25, $32, reserved seating, fees apply. Tickets are available online, by phone (502.584.7777, 502.562.0130 TTY) and in-person at The Kentucky Center box office. The production, underwritten by a $1million grant from Brown-Forman Corp., opens Saturday at the Kentucky Center's Whitney Hall. It is the single most ambitious effort the company has mounted in more than a generation. Tickets are available online, by phone (502.584.7777, 502.562.0730 TTY) and in-person at The Kentucky Center box office. Photo above: Instructor Harlina Churn-Diallo and Trey Hayden, 7, play the drums. When Highview resident Njoki Watene enrolled her daughter Wambui in ArtsReach Dance Studio classes at the West Chestnut Street YMCA a few years ago, she wasn't sure what would come of it. After all, her daughter was 7 and hadn't really expressed any desire to dance, much less work with a professional teacher. But after three years of free lessons offered through the program, which The Kentucky Center for the Arts sponsors, Wambui says she wants to be a professional dancer, and her mother says her daughter has blossomed into gifted dancer. Now in its ninth year, the ArtsReach Dance Studio Program is designed to form lasting connections between the local arts scene and some of the city's neediest communities by giving children access to professional artists who teach several styles, including tap, ballet, liturgical and African dance. More than 100 children participate in the classes, which are offered September through May. The dance studio program is part of Louisville's overall ArtsReach effort, which was established in 1989 and also includes a Suzuki violin program. Program director Julia Youngblood said the goal is to provide meaningful instruction from seasoned professionals. “This is not arts and crafts, this is fine arts,” she said. "While Congress considers how America manages its healthcare system, some art and health organizations in Kentucky are pushing to instill art into the healing process. Sure, art and music therapy programs already exist in many hospitals. And schools, including the University of Louisville, train these therapists whose work has specific medical outcomes. But having artists in health care centers, like The Kentucky Center is doing, is different, says Jeffrey Jamner, who oversees this new program. “The intent of the program is to provide opportunities for patients, their families, for staff to encounter the arts, to have an artistic experience, that we believe will enhance their healing process,” Jamner says. That idea has made inroads at some health care organizations. This year in Louisville, Norton Hospital, the James Graham Brown Cancer Center and other facilities have worked with the Kentucky Center to have artists there for a short-time with funding from the Humana Foundation. Administrators say the artists helped lighten the often somber and stressful environments." BRANDI CARLILE - VENUE/TIME CHANGED due to high demand! This Brandi Carlile date quickly sold-out The Kentucky Center's Bomhard Theater. To accomodate demand for tickets, this show is moving to The Brown Theatre on Broadway. Available seats go on sale to the public Friday, December 4. Friday, January 22, 9 p.m. Patrons who had previously purchased tickets for this performance in The Kentucky Center's Bomhard Theater have been contacted by the box office to exchange into seats in the Brown, or to receive a refund. Tickets for remaining Brown Theatre seats go on sale Friday, December 4, online, by phone (502.584.7777, 502.562.0730 TTY), and in-person at The Kentucky Center box office. Standard ticket prices: $32.50, $25, reserved seating, fees apply. One dollar from each ticket sold benefits Carlile's Looking Out Foundation, which has provided grants to the American Diabetes Association and Honor The Earth, as well as numerous other organizations. Listen to samples from Give Up The Ghost. Description: The emotional honesty of Brandi Carlile's live shows, coupled with her rich voice and literate storytelling, have established her as a singularly powerful singer/songwriter and performer. Carlile is touring in support of her 2009 release Give Up The Ghost, described as "music that gets under your skin and cuts to the bone" (allmusic.com). Nashville-based singer-songwriter Katie Herzig's most recent release is Apple Tree (April 2009).